When they finished the maintenance at this corporate office in Waverley, our client realised the tiles were dangerously slippery. The light coloured floor tile paired with the natural stone finish on the wall gives a cool and airy feel to the entrance and offsets the plants beautifully. However, the cream porcelain tile was very slippery and posed a risk to their visitors and employees. 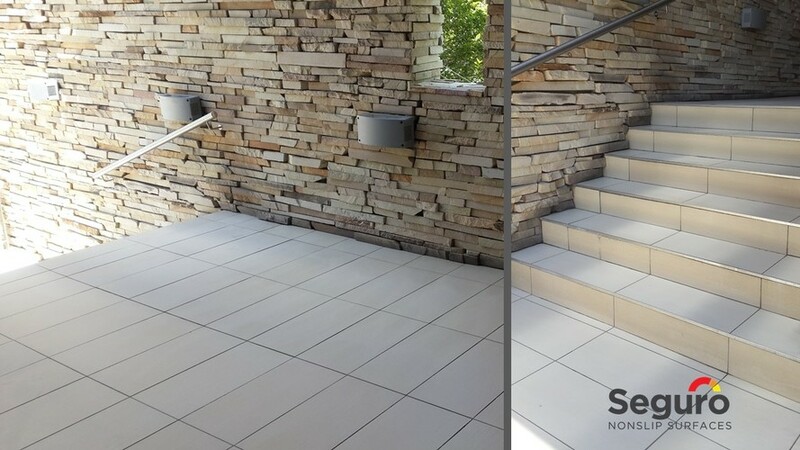 Our client needed an anti-slip solution that would not detract from the appearance of the tile or the design of the entrance. We recommended adding slip-resistance to the surface by applying our anti-slip coating to reduce the possibility of slipping and falling. The application is quick and the area can be used straight after we finish. The application process also cleaned the tiles beautifully and left the area looking brand new again. Our anti-slip coating is environmentally friendly and carries a 3 year guarantee.